Gatefold Sleeve. 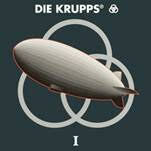 - Released in 1992, the album I saw Die Krupps' shift to metal-industrial and blew away both the EBM and metal scenes. This amazing double-LP vinyl reissue includes the full album remastered, as well as bonus material, early demos, and remakes! Side C includes five early demos, including the Metal Machine Music demo, and Side D has a mix of 2008 remakes of classic cuts as well as non-guitar versions for the purists! Comes in a gorgeous gatefold sleeve. Includes the hits "Metal Machine Music" and "Rings Of Steel."